What Sales Winners Do Differently: Collaborate. 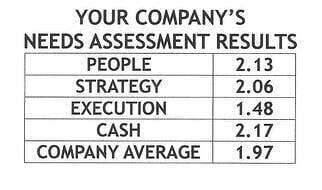 What Sales Winners Do Differently: Convince. Winners are more than twice as likely to create the perception that the overall value they offer is superior. When a second-place finisher doesn’t create this perception, it turns out it is the number one most important factor they needed to do differently in order to influence buyers to select them. Connecting. In our monthly sales training with one of my clients we’ve established that building rapport, respect, trust and the relationship is the most important part of the sales process. 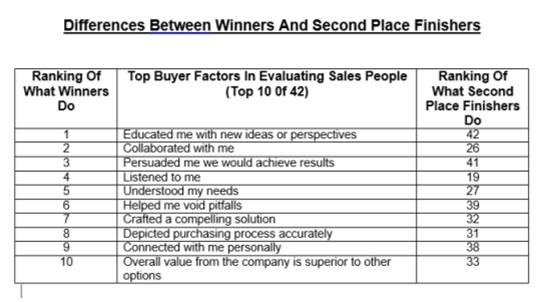 The RAINGroup.com’s study What Sales Winners Do Differently includes tips and research that diminish this aspect of selling in today’s environment.